When Greenfield wrote her chapter on video games in her 1994 landmark book Mind and Media, video games were played primarily in arcades, and popular opinion held that they were at best a waste of time and at worst dangerous technology sure to lead to increased aggression. As a cognitive psychologist and media scholar, she was interested in what was really going on in these games and brought the theoretical rigor and research tools of her discipline to bear on games and their cognitive effects on game players. Part anthropologist and part stranger in a strange land, she studied games and game players and played games herself. Her conclusions at the time were both surprising and prescient; research failed to support the common sense connection of games and violent behavior, and games in fact appeared to have cognitive benefits unseen by those who did not play them. Her conclusions both provided a glimpse of then-current research and laid the foundation for a rigorous empirical study of games and cognition. What is shocking upon rereading this chapter today is how relevant it remains and how many of the research possibilities remain largely unexplored. Her chapter is reprinted here along with her current analysis and thoughts about her original ideas, 25 years later. Its placement as the first chapter in a book dedicated to cognitive perspectives on games is appropriate, both as a reminder of where we come from and how far we have yet to go. When this chapter was published 25 years ago in Mind and Media: The Effects of Television, Video Games, and Computers, video games were a new phenomenon that many saw as potentially dangerous. Counter to the prevailing zeitgeist, I pointed out the complex cognitive skills required to play the games. In my own laboratory, my analysis provided the blueprint for an experimental research program over the next 10 years on the cognitive processes developed by action video games (Greenfield & Cocking, 1994). 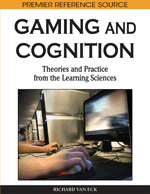 With the popularity of the book (it has been translated into nine different languages since then) and of games as a medium, I assumed that others would take up the threads of the research questions raised here and extend the study of the cognitive and social effects of video games. In fact, a few other researchers did take up this line of research in the years following the publication of Mind and Media (De Lisi & Cammarano, 1996; De Lisi & Wolford, 2002; Dorval & Pepin, 1986; Gagnon, 1985; McClurg & Chaille, 1987; Okagaki & Frensch, 1994); but this line of research—investigating the cognitive effects of video games—was definitely out of the mainstream. Today, the prevailing zeitgeist is quite different. There currently exists a strong “serious games” movement, and my once shocking assertion that popular games develop important cognitive skills for a technological world is now taken for granted. As the zeitgeist changed, new research paradigms for studying the cognitive skills used and developed by video games began to appear and go mainstream, as the tremendous response to Green & Bavelier’s (2003) study showed. Yet Green and Bavelier studied the same basic attentional issues as Greenfield, deWinstanley, Kilpatrick, and Kaye (1994) a decade earlier and found a very parallel developmental role of video games. The history of research on social effects of video games has been a bit different from the history of research on their cognitive effects. In one area of social development, aggression, research has been more continuous and cumulative. Notably, systematic research on the impact of video game violence accelerated, to the point where the quantity of studies made meta-analysis possible (Anderson & Bushman, 2001). I attribute much of this difference in the research trajectory between cognitive and social effects to the influence of television research, where violence and aggression (the dangers) have always garnered much more attention than cognitive skills (benefits). Another reason for the differential trajectory in these two areas of video game research may be the fact that when children first started playing video games, thematic content (notably aggression) was obvious, even to the unskilled (in video game play) observer. The cognitive domain was different in this respect: researchers, not having grown up with video games or knowing how to play, often lacked the cognitive skills that were being developed by the games. Indeed, in my video game investigations, I was an anthropologist going into a foreign culture (Greenfield, 1984; Greenfield & Cocking, 1994), a foreign culture that very few others of my generation dared to explore. In sharp contrast to the first generation of potential and actual video game researchers, Green, a graduate student in 2003 when the Green & Bavelier study was published, was an expert video game player and was studying the cognitive effects of his own cultural experience. We now have a whole new generation of researchers, gamers themselves from a young age, for whom video game research is a natural and easy extension of their own experience.